Flowering Trees | Relax, it's just Life! It POURED rain last night and so this morning as the sun came peeking through the trees I zipped outside to snap a couple of photos. The first tree is a “bottle brush” tree. It is one the hummingbirds just love – bright red, and the blooms do look like bottle brushes! 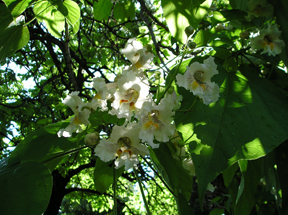 This one is a huge tree and has blossoms that look like orchids to me. I haven’t been able to find out the name of the tree, but if anyone knows, please let me know. This entry was posted on May 2, 2007 at 7:00 pm and is filed under Uncategorized. You can follow any responses to this entry through the RSS 2.0 feed. You can leave a response, or trackback from your own site. Marsha – this bottle brush tree is really strangely beautiful- I have never seen anything like it – is it native to California? Wow! I especially love the tree. I cant see the flower well enough but it might be a magnolia tree. I saw some like this in Malaysia. If you can do a bigger photo of just the flower, maybe I can tell you. Wow! I especially love the tree. I cant see the flower well enough but it might be a magnolia tree. I saw some like this in Malaysia. If you can do a bigger photo of just the flower, maybe I can tell you if that’s it.